In order to bring our grim national ordeal to a controlled and near-term end, the following Presidential Resignation Agreement is humbly presented to my fellow Americans, the 535 members of the US Congress, and to the President of the United States. the following Presidential Resignation Agreement (Agreement) is made between President Donald J. Trump (President) and the People of the United States of America. The President will officially resign from his office in order to activate this Agreement. Immediately thereafter, as Vice President Michael R. Pence will be sworn in as the 46st President of the United States. Under this Agreement, President Donald J. Trump, his daughter Ivanka, two (2) adult sons Eric and Donald, Jr., his son-in-law Jered Kushner, and longtime lawyer Michael Cohen are hereby granted total and complete immunity from all criminal and civil prosecutions. Whether or not, such total immunity will be granted to any other person(s) under this Agreement will be determined by the US Congress. Love it or hate it, and all things considered my fellow Americans, this Agreement offers a prudent and practical resolution to our growing crisis in national leadership. Objectively analyzed folks and regardless of the final outcome of the legal issues surrounding his political and personal activities – our nation, our Democracy, our society, and our leadership position in the world cannot long endure the unending chaos and general incompetence that is the Trump presidency. President Trump often boasts of his deal-making. This would be the greatest deal of his life. The day was truly encouraging. So many people of all types and ages. Strollers and Grandparents. I pray that this movement - that these teenagers have created - will continue to grow among people of all ages and across the nation. I hope we can all help them to get 18 to 30 year olds (and older) registered to vote this November. And that we keep the pressure on the members of Congress, mainly Republican, that favor the NRA over common sense gun laws. Most gun owners support better gun laws. The NRA never will. These brave and well-spoken teenagers have the real opportunity to turn this tragedy in something that will make the future safer for students, teachers, and other innocent people, as well. 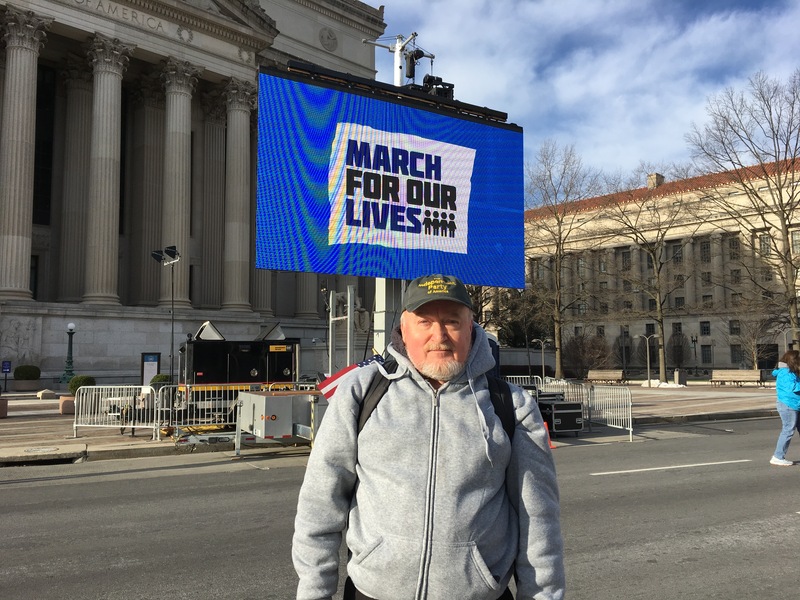 I attended the March in DC last Saturday. The first of 7 pics/videos. That's me! Got there about 8am from west of Baltimore City. I wonderful mix of people of all types and ages. Wonderful feeling among the crowd. This is about 8:30am down at the stage at 3rd and Pennsylvania Avenue. Crowd already forming. 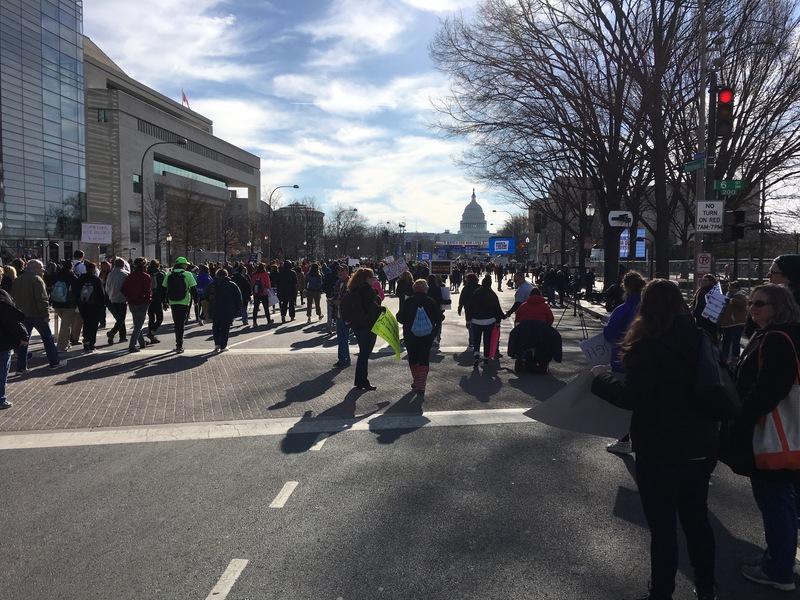 The People coming down Pennsylvania Avenue toward the Capitol. 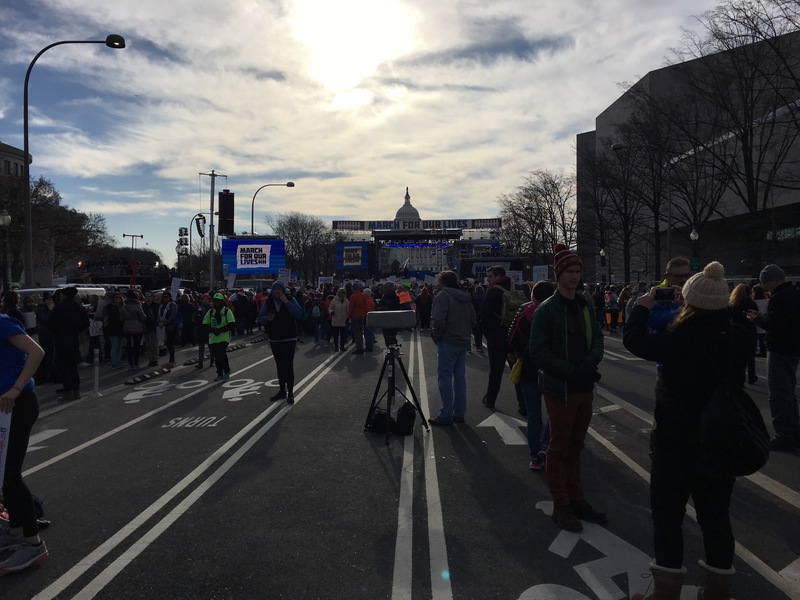 Stage was 3 blocks in from the Capitol Building. 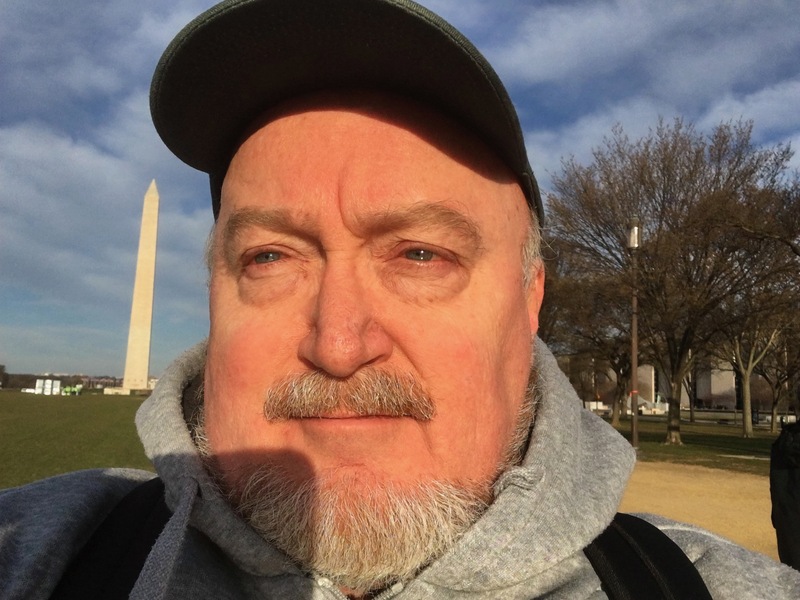 Sorry, yes it is me with Washington Monument in background. DC is my hometown!! Love it. This is me in my hometown. The crowd just keeps coming. Walking toward Capitol building. Stage program started at noon and went beyond 2:30. Wonderfully organized program. Speaker and/or singer one right after the other. By noon crowd is packed from 3rd and Penn, passed 9th st and to the White House. 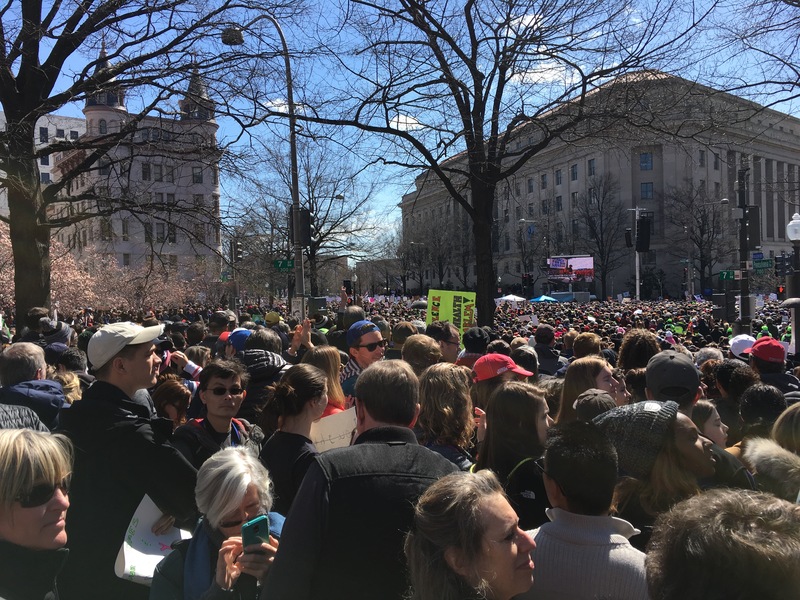 Estimated 800,000 of us!! Short video of when the People had their signs held up. There were signs everywhere. Fantastic!! A wonderful day for America. We must keep it moving. A video of Their Signs Held High!!! Finally, here is a link to my proposed Amendment to the US Constitution that will clarify the Second Amendment - The Right to Bear Arms. It called, Gun Rights and the Death Penalty. So please encourage everyone you know to get registered to vote! And on November 6st let us all go to the polls and vote out our dysfunctional Congress. Especially, the Republicans. God Bless the Students and God Bless America!!! Announcing the CS2News Channel - Edition 01 - Why We Will Vote! This posting provides YouTube and PodCast links for the latest Edition of the CS2News Report. Hello, there. This is A J Wildman. I am pleased to announce the production of the First Edition of the CS2News Report. It was posted on Wednesday March, 7, 2018. We will produce 1 or 2 videos per week during initial operations. The Editions will run from 10 to 30 minutes in length. Length will totally depend on the subject matter and how much we have to share with you about it! Occasionally, it will just be a few minutes of ranting by me about some issue! CS2News, is an Internet-based, politically independent news report. It is presented to the American public as a reliable news source by A J Wildman and The Independent Party of America (OurTIPA). The program will develop as we get used to running the show and get a better idea of what the audience wants to find out about. CS2News will provide the public with Perspective, Information and Education on issues effecting our day-top-day lives. It is time for REAL Solutions to REAL Problems! The CS2News Channel currently has two (2) Playlists. The first contains forty (40) -- 5 to 10 minutes videos. Each video reviews a different Platform Proposal of The Independent Party of America (OurTIPA). The other playlist contains the various past Editions of the CS2News Report. Links to both Playlists are presented below. Thank you for your time taking a look at our Blog. For real details on our proposals go to www.commonsense2nd.com and under the Solutions option. Tab down and you will see links to the various part of our Independent problem-solving platform. The Independent Party of America (TIPA). I created the AP Party in 2011. I liked the name because I believe it spoke to how we the Masses of Americans were and still are actually treated by the dysfunctional US Congress and the those that really pull their strings. Those being the Wealthy and certain Big Industries. I detailed my thoughts on that imbalance in the book, The Second Coming of Common Sense (CS2) that I self-published in February of 2008 (see commonsense2009.typepad.com). Recently, I determined that it is time to go all into the national political arena. The nation and We the People need a true political party alternative. Further, our nation’s day-to-day economic and social problems actually need to be fixed rather than ignored! My absolute intent in 2018 is to make a real and publicly positive difference in this year's 2008 Congressional campaign and the November 6, 2018 Election results. In doing so, I will lay the proper ground work and build public credibility – for my run for President in the 2109/2020 campaign cycle. I am already certified as a 2020 non–party affiliated, Independent Presidential candidate with the Federal Elections Commission (FEC). I determined that it was politically practical to rename the AP Party to The Independent Party of America (TIPA). Frustrated voters and our broken political system has long needed a viable third Party. And a purely politically Independent one at that! The party nickname is “OurTIPA”. A viable Independent party with a comprehensive, problem-solving economic and social platform designed to confront and resolve "our citizen’s" Common Problems. Not just another one or two issue "political entity" that voters have historically lost interest in. Also, offering voters candidates that cannot talk to a broad range of issues and offer workable solutions to their day-to-day problems. The 27-part proposal base of our comprehensive Independent political platform was detailed in my book CS2 in 2008. It is called, An American Agenda. Those problem-solving proposals are even more relevant for 2018 and beyond. Those 27 proposals are easily referenced from this BLOG. On the TIPA Platform website, www.commonsense2nd.com you will find those proposals, plus more solutions related to the out-of-control Cost-of-Living crisis, the Environment (the climate deniers), and other relevant public issues. All are detailed in writing and most are presented in 40 short videos linked from that site to our YouTube channel “CS2News”. I produced and posted those videos in the weeks before the 2016 National Election. So please come and join me in aggressively confronting the dysfunctional US Congress and our obviously broken 2-Party Political System. The system that no longer works for We the People. In 2018, we still have ample time to remove many incumbents from both parties, but with a particular targeting of the totally sold-out Republican Party. Yes, the Democrats Party is at least half sold- out, too. However, the Republican climate deniers, health care deniers, Big Industry lovers, and tax breaks for the Wealthy givers, have got to go in 2018. We can attract the necessary votes in all 50 states to make that happen. Period!! At the same time in 2018, we will clearly hold the Democrat Party that has no real platform, accountable for implementing the TIPA sponsored Independent platform. We are not talking about “hope’ or “change” anymore, folks. This is all about real legislative Reform. Please watch this BLOG, review the Platform website, www.commonsense2nd.com and watch for my periodic (once or twice a week for starters) Internet broadcasts on the CS2News, YouTube channel. Starting in late January. Please tell your "politically disgusted" family and friends about this Independent party and our platform. Our Independent Party, OurTIPA!! It is going to get positively interesting my fellow Americans. It is time for We the People to win. Let's join together and make it happen! COUNTDOWN - Now 10 Months to the 11-6-18 Congressional Election - Let's Reform Congress! I had make a short post today. I am now a Federal Elections Commission (FEC) certified candidate for President of the United States in the 2020 National Election. However, that great effort will be a greater issue starting in early 2019. However, we have critical challenges to be confronted and acted upon right now in 2018. I will have announcements on 2018 actions for the nation to consider starting on the next few weeks. Here is a quick look at the primary challenge for We the People, and the American Electorate in particular to attack leading up to the 11-6-18 VOTE. Again, I will go into "Whys" and details of all this in Postings to follow. This is the brief of the next three (3) years! Remember, I am a hard political Independent, a systems analyst, and professional business problem solver. I fully declare that both the Democrats and Republicans in Congress as failing the Common Good of our citizens. The 2-Party System is terminally broken. A Third national political Party will be born this year and come into full functional maturity in the 2019/2020 Presidential and Congressional campaign. In 2018, the Voters will be organized and aggressively act to begin resolving the legislative roadblock that the 535 current members of Congress now presents us with. In 2018, we will first organize the public and interest groups to vote out every Republican member of the US Senate and US House as possible on 11-6-18! It could be easier than you think!! Not that we want a Congress full of Democrats (No). Especially, not with the non-platform they currently have. The voters in discharging the majority of the Republican Party from Congress will be indicating their support of my politically Independent, problem-solving platform that will be welcome publicized this year. See www.commonsense2nd.com for REAL details! Again, as will be detailed to the public in the next month or so there is still time in most states to run non-party affiliated Independent candidates for Congress in November 2018. Absolutely! This process could replace Republicans and Democrats in 2018. First, they could still be on the actual ballot if enough signatures by petition are gathered. Or, they could be a simple Write-In at the polls often with little paperwork. I am researching and will publish the state-by-state requirements in February. You can find out the details for your state by calling the Secretary of States Office in your state. They are helpful people. Such candidates will support run in support of our Independent platform - not under a Party in 2018. Either way could work in this politically charged year. The more Independents we could get into Congress this year the better. It will set set the stage for the full third Party movement into Congress in 2020! There are 293 Republicans running for re-election (again) in 2018. The more of them that are voted out this November the better. There are 33 of 100 US Senate seats up for election this year. Of those 33, eight (8) of them are Republicans, 23 are Democrats, and two (2) are Independents. That is as short as I can keep this. Much more encouraging and problem-solving information to come. Last Day of the 31 Day Countdown to 11-8 with One Real Problem Solution a Day. Amen!! NOTE: There will be a posting tomorrow regarding the election's possible outcomes. Again, to put an even finer edge on our situation with Congress. This last solution proposal to be posted on this Blog in the series of 31 AP Party Proposals and related YouTube Brief. Its political topic is rather simple when compared to some of the difficult issues that came before it, but still worth our consideration. I added it due to the 2016 campaign cycle and the terrible circus it has been. This proposal would require all Presidential and Congressional election to have a traditional Primary structure and eliminate the caucus format such as is utilized in states like Iowa. For one reason it would just that standard across the country. Secondly, and most important to me is that it would be private for each person. In a caucus format, people have to literally stand in public and declare their candidate preference. It is not private and the majority of people are not comfortable expressing their political views in public. There would continue to be a separate national office Democratic and Republican primary in each state. Finally, with the Independent movements growing across America we may need to allow for a third primary for all non-Democratic and non-Republican candidates to be voted upon. Be aware that the Democratic and Republican will fight this option from ever happening. That is it. Something else to think about. and the Republicans, in particular. See the full chart link below for all 31 YouTube Proposal Briefs, including eight (8) more Platform proposals addressing Climate Awareness and International Issues. Our efforts will continue to be promoting the “Vote out ALL Incumbents, and Republicans in particular” message. We will be using Kickstarter and various petition sites to help raise awareness of the AP Party problem-solving platform and gather supportive funding for our efforts on your behalf. This proposal is short, but the topic is not very sweet. It speaks to the true spirit of voting rights under our Democracy. This issue concerns what people are somewhat surprised to learn – why some American citizens are not allowed to vote in Federal and lower level elections. Today, by law if an American citizen has been convicted of certain types of more serious crimes e.g., a felony of some sort — then fully serves their court prescribed sentence, and are then returned to society — they are too often not allowed to vote again in Federal and lower level elections. Not allowing someone to vote after paying their legal debt to society makes him or her feel at best a second-class citizen which does not tend to build much faith or fondness for the legal system or the government. It would tend to make them feel and speak unfavorably to others regarding the law, government, and the act of voting in general. This will all be corrected and avoided in the future. Yes, this is a difficult issue to address, but it is important relative to honestly confronting the civil rehabilitation of some of our fellow citizens. All for one!! In particular, click the link for the "Solutions" option of that website for the details on The 27 Proposals of An American Agenda. PLEASE pass this on to everyone you know across your community and the across our nation. Our efforts are promoting the “Vote out ALL Incumbents, and Republicans in particular” message. We will be using Kickstarter to help raise supportive funding for our efforts on your behalf well beyond the 11-8 Election Day. NOTE - Due to a very busy schedule I am missed posting Day 4 and Day 3. My apology! This National proposal addresses long-standing and quite avoidable procedural issues regarding our national level elections. These Democratically practical changes could rapidly “trickle down” to state, county, and local level elections, as well. The issues here boil down to date and time! First, the traditional first Tuesday voting date in November will be immediately and permanently moved to the first Saturday in November. This will make it far simpler for more Americans to vote. Second, the range of hours the polls are open will be standardized to The Second Coming of Common Sense approximately 10 to 14 hours. Due to the 6-hour time zone difference between the Atlantic Coast and Hawaii, the opening times could be staggered. However, the poll closing times will be simultaneous across all time zones from Maine and Florida, to California, as well as to Alaska and Hawaii. More Common Sense! This Amendment will effectively bring a Constitutional end to the Supreme Court decision on Citizens United. It will remove 100’s of millions of dollars from political campaigns at all levels of government. • Again, this legislation and resulting Amendment is will override the provisions of Citizens United! • We will be considering a $5,000 maximum per individual a year for a given candidate. • We will be considering a $25,000 maximum per corporate entity a year for a given candidate. • We will be considering the elimination Super PACs altogether. • There will be no more “dark money”. No undisclosed sources of campaign funds will be allowed. For the good of our political system, We the People need to put the Supreme Court in its place this time! In particular, click the link for the "Amendments" option of that website for the details on all five (5) proposed Amendments to the US Constitution. In the first Trimester, abortion on demand will be legal, allowed, and provided in a safe environment for women. In the second Trimester, abortion will be legal and allowed if the Mother’s life is at risk. Or, if it is determined that the fetus is “at risk” and in that situation only the Mother and/or Parents will make the final decision – not any court! And “partial birth” abortion (except to save the Mother’s life) will not be allowed. In the third Trimester, the same criteria will apply as in the second Trimester. Period! So let us discuss this Amendment, pass it into law, have it ratified by the states, and make it a permanent part of the US Constitution. Please let it be settled once and for all. Amen. We will be using Kickstarter to help raise supportive funding for our efforts on your behalf up to and well beyond the 11-8 Election Day.